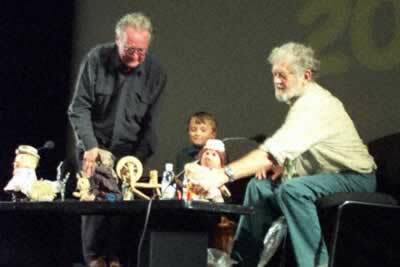 Oliver Postgate, Peter Firmin and Loaf of the Dragons Friendly Society presented "The Pogles" to an audience of over 400 people of all ages. Last out of the basket, but by no means least was Pippin, and the ever-playful Tog was found hiding in the audience and judging by their reaction, he is a firm favourite. This was a unique opportunity for people to see The Pogles in person.. and in 3d and in colour ! If you are interested in attending please email us by following the link at the top of each page.